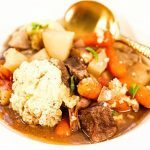 Best Crockpot Beef Stew starts with beef slowly simmered in the slow cooker until the beef is spoon tender. Stuffed with carrots and potatoes this is an easy meal that tastes AMAZING! Let your crockpot do the work for you! Add the beef stew ingredients in the slow cooker - beef, carrots, celery, tomatoes, potatoes, red wine, salt, thyme, mustard powder, salt and pepper. Stir to combine. When the stew is done, it's time to add the dumplings. In a medium bowl, mix baking mix, thyme and sage. Stir in milk just until it is just combined. Drop dough in small spoonfuls (use a small cookie scoop) on top of the stew.